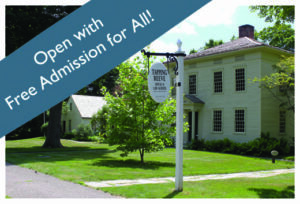 The Tapping Reeve House and Litchfield Law School takes visitors on a journey through the 19th century life of a real student who came to Litchfield for an education at the Litchfield Law School or the Litchfield Female Academy. Through role-playing, hands-on areas, and interpretive exhibits, each visitor explores timeless issues of travel, communication, education, and community. The Litchfield Law School is the Nation’s first law school. Touring the school showcases the evolution of law education and instruction, while exploring how Litchfield became home to such a valuable institution. Visitors of all ages are encouraged to meet the students as they watch the introductory video Coming to Litchfield. Throughout the Tapping Reeve House, visitors can experience student life as they try on period clothes, make decisions about what supplies to buy, and vote on issues of the day. The Ledger is a database containing biographical information for students and instructors of the Litchfield Law School and Litchfield Female Academy. Details about what you will find can be found here. Tuesday-Saturday 11 a.m. to 5 p.m.